Makule'ia Bay is the bay immediately to the south of Honolua Bay and is located on the forty-five acre Honolua-Mokule'ia Marine Conservation District. This beautiful bay, which is sometimes referred to as "Slaughterhouse Beach" because of the slaughter-house that was once located near there, is located just off a huge "s-turn" on the Honoapi'ilani Highway between the town of Kapalua and Honolua Bay. 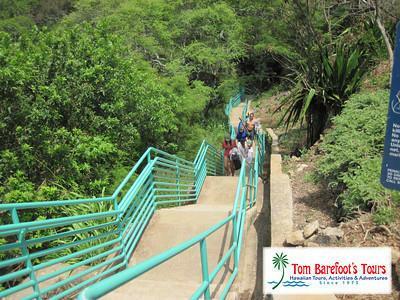 One has to negotiate an extreme descent down the cliffs to get from the parking area located alongside the road to the beach below, but the construction of a fabulous stairway down the hillside makes this a fairly easily accomplished task. Once at the beach you will be delighted with the beautiful, wide, white sand beach and the spectacular views it offers of Molokai in the distance and the channel between the islands. Snorkeling, body boarding, boogie boarding and sun-tanning are the primary activities at Makule'ia Beach. 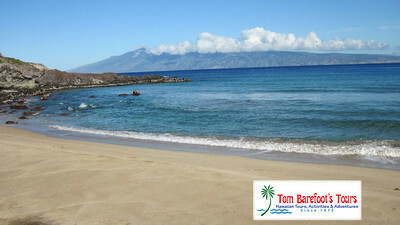 As with its adjacent bay of Honolua the best conditions for snorkeling are in the summer months when the surf is down. Snorkeling out to the points on either end will reward you with views of great coral formations and abundant sea life and spotting the Hawaiian Green Sea Turtles is a great likelihood here. Body boarding is tremendous here primarily in the winter months and the white-water rides are longer than in most locations. If you're just looking to lounge on a beach this particular spot has that romantic "end of the earth" sense to it that makes you feel that the rest of the world is in a "time warp" far, far away. Its a steep staircase, but worth the walk down and back. Amenities at Makule'ia Beach are not abundant. There is parking up at the road which abuts the staircase entrance to the beach but the list of amenities makes an abrupt halt at that point. That being said, this is still one of the most beautiful and unique beaches that Maui has to offer. Please be advised that all beaches and ocean locations in Hawaii can be potentially dangerous including this location. Be completely aware of the ocean conditions prior to entering the water and of course, never turn your back on the ocean when you are on the shoreline. It should also be noted that all shorelines and beaches in Hawaii, including this one, can be frequented by sharks, jellyfish and other sea creatures which can provide potential harm to people entering the water. Kanaha Beach is one of the major beaches located on Maui's north-central coastline. Kanaha is actually an enormous series of adjacent beaches that stretch through no less than five separate parking entrances.